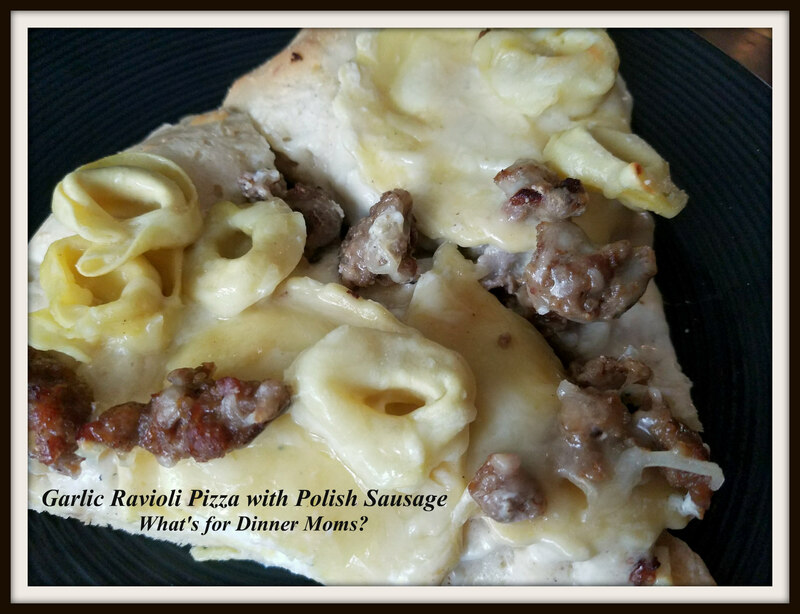 Garlic Ravioli Pizza with Polish Sausage – What's for Dinner Moms? My family likes to try and stump me sometimes by taking two or three packages of meat out of the freezer and then have me try and make something different from each one. The other day they took out chicken, bacon, and Polish sausage. Chicken and bacon were super simple. The Polish sausage stumped me a bit because I really didn’t want a pasta dish and thought just plain grilled sausage was too boring. So, I started doing what I encourage everyone to do. Think outside the box. Soup, casserole, pizza…. Pizza it is! Everyone was a bit skeptical when I proposed this but once they had a bit they loved it! It is VERY filling. 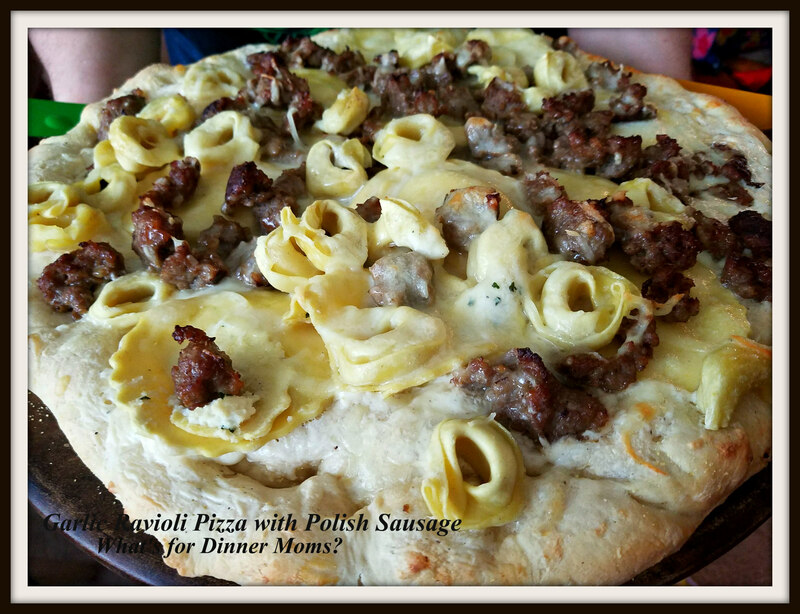 The dough I had was light and crispy (I would go thinner on the crust next time) and was good with the ravioli, sausage, and garlic cheese sauce which are all quite filling. I served this with a spinach salad to complete the meal. Spread dough out onto pizza stone with corn meal or grease rimmed baking sheet to desired thickness. To make garlic sauce: melt butter in a saucepan over medium heat. Sprinkle flour over the melted butter and whisk for 1-2 minutes to form a thick paste. Pour half and half into pan with salt and pepper. Stir well until no lumps are present. Add garlic to pan and cook for 4-5 minutes. Sauce should begin to thicken. Add Parmesan cheese to pan. Once cheese has melted remove from heat and allow to sit to thicken a bit more. Taste and adjust spices as necessary. Spread garlic sauce over crust. Place ravioli over the top of the pizza. Sprinkle the crumble Polish sausage over the pizza. Bake for 10-12 minutes until crust is golden brown and cheese is bubbly and starting to slightly brown on top. Remove pizza from oven and allow to rest 5 minutes before serving. Again, I appreciate your creativity. Always keeping things family fun. Thank you for getting it, Sylvester! Definitely thinking outside the box! Lol. Thanks! Sometimes you have to do what you have to do. So, this is a creative recipe! Awesome!! You are welcome, Marci! I like your ideas! Your post always make me so hungry. I need to start getting ready to make dinner, looks like pasta it is but this recipe needs to be tried out at a later date for sure. Yummy. I love pizzas because you can put anything on them!